Today's post ambles a bit. I know it may seem at first glance that poverty alleviation work in Honduras and Ohio don't seem to be related to breastfeeding, but if you're willing to keep reading, I'll get there. I promise. 1. Poverty is about broken relationships, not just about money. This means every single one of us is impoverished in some way in our lives. 2. Healthy, sustainable, long-term development starts with looking at assets and working in partnership to build on those assets. Before my first trip to Honduras, I went to the doctor for a check-up. When I told him about the trip we were planning, he scoffed. "Honduras?! To build a house? For crying out loud. People go down there all the time year after year to build houses. And there's always more to build. Why do these people still need us to build houses for them?" At the time I was incredibly offended by his insensitive remarks. But years later it's clear that his frustration makes sense. If I continue to throw money and time at a problem and it isn't resolved, wouldn't that indicate I need to try something different? What kind of message am I sending to people I'm "helping" when I say: "Hey, just take a step back, I'll be able to fix this wayyyyy better than you can." What am I believing then about that person's value or their competence? Since that first trip I've been able to spend time in Las Lomitas, Honduras, not fixing or building or teaching, but simply being and learning. When I was simply present I learned how to grind corn into cornmeal and make tortillas. My friend learned how to mow the soccer field with a machete. Roasting delicious, fresh-picked coffee beans, crafting jewelry from trash, maintaining a clean home with only erratic running water... Once I stopped scratching the itch to always be fixing it was so much easier to move from a deficit focus to an asset-based one. I've learned a lot about ABCD over the past few years, but time and again I'm reminded of how much I have yet to learn. Recently I overheard a conversation a friend of mine, Tracy, was having with someone in our poverty alleviation group here in the states. Let's call this other person Andrew. Andrew was venting about an issue one of his kids was having at school. It was clear he was frustrated with the teachers there. In fact, it seemed like he was frustrated about a lot of things. Tracy gently asked him if he had considered talking with the school counselor. "She doesn't help with stuff like this," he replied shortly. Tracy responded with sympathy and continued to listen. What!? I exclaimed in my head. As a former teacher I knew that the school counselor would, in fact, help with this issue. I can't believe Tracy isn't telling Andrew how to contact her! I mulled that conversation over in my head for days. How on earth did she have the patience to sit there and listen when she knew the solution to the problem? More importantly....why? I played out an alternate scenario in my head. One in which I kindly corrected Andrew and gave him some advice about how to approach the counselor, as well as a few other resources on the issue at hand. In this hypothetical conversation, I even shared a personal story about a student I'd had in second grade who had dealt with this very situation and how I helped the family resolve it. Believe it or not, the scene didn't end in my head with Andrew showering me with gratitude for sharing my wisdom. It didn't end with him contacting the school guidance counselor. It ended abruptly when he politely listened to me ramble, then completely shut down. As my imagination moved forward, in the future weeks he would greet me every Tuesday night, but wouldn't ever share what was really on his mind. He wouldn't ever again trust me enough to be vulnerable with me. And it dawned on me: Tracy had played this scene out in her mind before. Heck, maybe she'd even made a few mistakes along the way and lived it out: the dispensation of advice, the taciturn response, the loss of trust. Tracy knew this wasn't true development. Tracy listened and empathized because she's in it for the long haul. She's patiently backing up far enough to see the whole picture. She's not trying to fix one problem today, she's trying to be a small part of sustainable development in a person's life over time. She recognized that Andrew didn't need advice at that moment. Read part 2 where I share more about how these experiences have shaped my perspective of breastfeeding culture in our country. 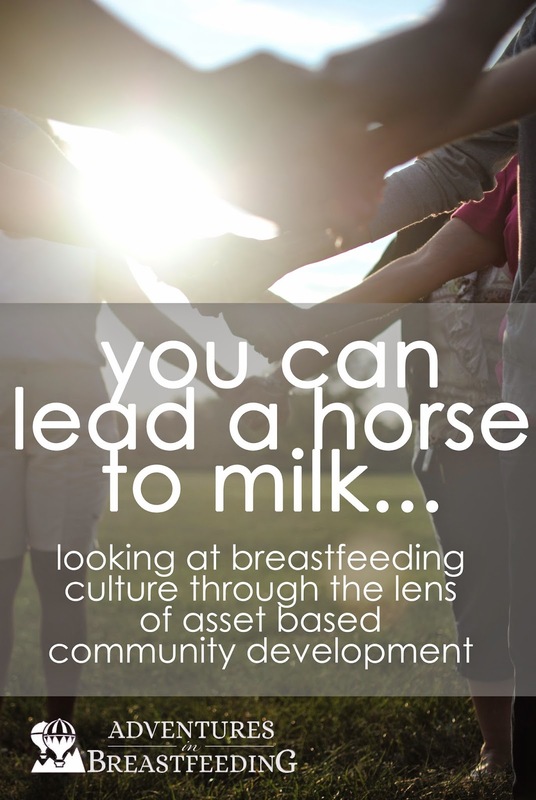 In the meantime, if you'd like to learn more about asset based community development, I highly recommend the book When Helping Hurts and the blog of my good friends who are in Honduras putting these practices into action.